While the church is more than a building, we believe in the importance of investing in a local base of operations for our ministry in the impoverished communities we serve. We help our churches secure a building because they use their building daily for the good of the community by hosting worship services and Bible studies, providing meals and food to the community, teaching classes, providing after school programs, and much more. 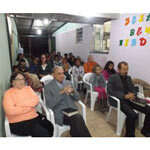 Earlier this month we inaugurated a new place of worship for our church plant in Planalto. We pray this location will be even better than their last location. The church planter and his family will be living in a house on the same property where they will be safer and more comfortable, and the space for worship services and children’s ministry is larger. The church held a special worship service to celebrate opening the doors of this new location. More than forty members of the community, both adults and children, were present for the service. 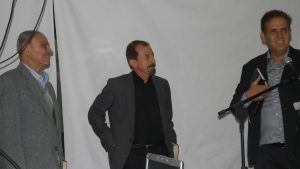 We were also honored by the presence of Pastor Wilson Alves de Oliveira, a retired church planter who was one of the first Brazilian Baptists working in this area, and his wife Isalmar. 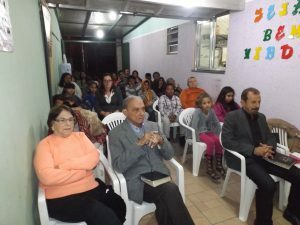 The LBM Brazil team is overjoyed and encouraged by the response of the community and grateful for the new building, as well as a new sound system that was presented by a generous donor! May God be honored and glorified, and may the people of Planalto be blessed by this provision!